Learn the Tibio-Talo-Calcaneal (TTC/Double )fusion using Zimmer Ankle Fix plus plate. surgical technique with step by step instructions on OrthOracle. Our e-learning platform contains high resolution images and a certified CME of the Tibio-Talo-Calcaneal (TTC/Double )fusion using Zimmer Ankle Fix plus plate. surgical procedure. Tibio-talo calcaneal fusion (TTC) is a less common operation for arthritic and other conditions of the hindfoot. It consists of fusing both the ankle and subtalar joints to create a block of three bones which includes the distal tibia, the talus and the os calcis in a strong and stable column. The requirement for rotational stability is of pivotal importance and it is this need that is often difficult to achieve in the presence of severe deformity, loss of bone stock and undefinable deformity such as Charcot arthropathy or osteomyelitis. Simple screw fixation or the older devices such as the angled blade plates or non anatomic plates have significant disadvantages both in biomechanical and biological terms. The intramedullary locked retrograde ankle nail remains an excellent implant as it offers axial compression as well as rotational stability. However its use is restricted by anatomical considerations such as poor calcaneal bone stock or deformity, small calibre tibial canal, previous deformity, fracture, or other sclerotic of the distal tibia. 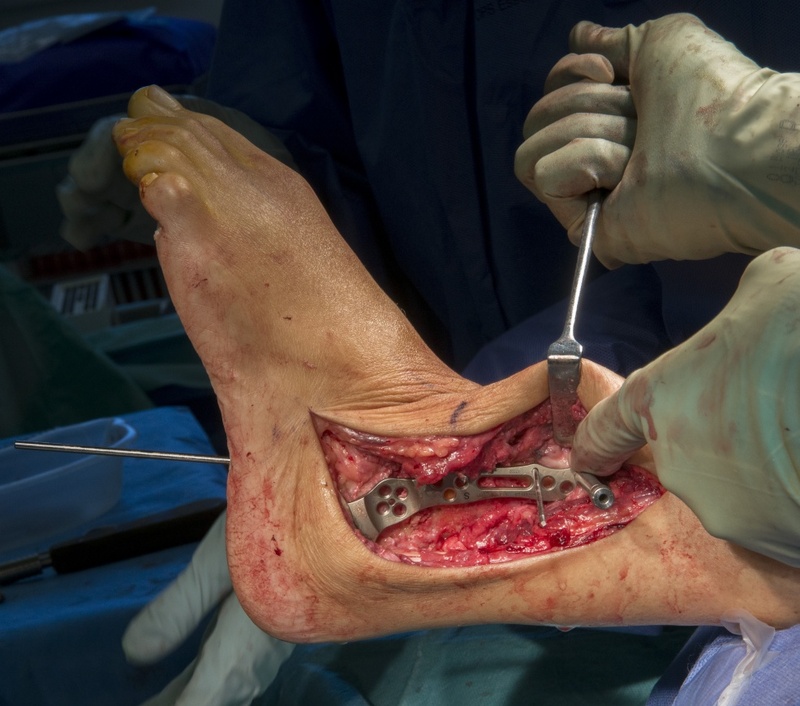 It is to address some of these issues that the AnkleFix Plus plate was developed in Sheffield UK by Consultant Orthopaedic and Foot and Ankle Surgeons, Mr.Mark Davies and Mr. Chris Blundell. It is an anatomically contoured, fixed angled lateral locking plate which spans both hindfoot joints and offers major biomechanical advantages over conventional plating devices currently available. The use of divergent screws within a low-profile talar section offers a significant pull-out strength in cancellous bone and similarly convergent screws in the tubular, cortical bone offer the advantage of secure tibial fixation. It is easy to use, has a variety of plate options and sizes and has some Level 4 Evidence published by the originators of the implant.